Welcome to Americas Best Value Inn located in beautiful downtown Bishop/ California. Bishop is known as the -Mule Capital of the World- and hosts a week-long festival called -Mule Days- that has been held annually since 1969 during the week of Memorial Day/ celebrating the contributions of pack mules in the area. Our hotel is easy to find and only minutes from the region-s year-round attractions and activities. Explore the area-s history at the Bishop Museum and Historical Society and Laws Railroad Museum. Or participate in any of Bishop-s community events held at the nearby Tri County Fairgrounds. Enjoy our continental breakfast served each morning from 7am - 9.30am consisting of cereal/ muffins/ coffee/ and juice. Tempt your taste buds at any of the local restaurants within a mile of our hotel/ which include La Casita/ Bar BQ Bill-s-Oney-s/ Raymond-s Deli/ Taqueria Las Palmas/ Jack-s Restaurant/ and Pizza Factory. Americas Best Value Inn Bishop provides exceptional room rates and service with a smile. Our well-maintained property offers clean and comfortable spacious guest rooms generously furnished with free wireless high-speed Internet access/satellite TV/32 inch flat screen TVs/HBO/Cinemax/Starz/Showtime/microwave/ mini-fridge/ coffeemaker/ hairdryer/ table with chairs/ and free local calls. Other amenities include a seasonal outdoor swimming pool-open Memorial Day weekend to Labor Day weekend/ guest laundry facility/ BBQ area/ vending machines/ free parking/ and fax/copy services. Pets are allowed - a maximum of 2 pets per room are welcome for a nightly charge of 10 USD per pet. Our friendly staff looks forward to your arrival. At Americas Best Value Inn Bishop/ We-ve Got You Covered from the time you hit the road until your head hits the pillow. 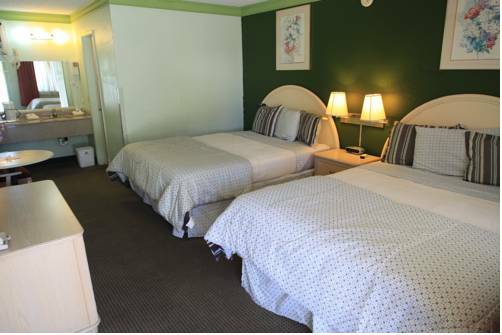 Americas Best Value Inn Bishop is conveniently located on Short Street in downtown Bishop/ less than 2 miles from Bishop Airport. Our address is 192 Short Street/ Bishop/ California/ 93514.